Buy Dominion and PriceWatch, Buy this board game at the Lowest Price. 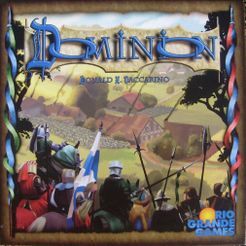 Dominion is a fast-paced card game in which you race and fight with other monarchs in your quest to gain control of as much land as possible. To do this, you will hire minions, construct buildings, spruce up your castle, and fill the coffers of your treasury. All in the name of creating the largest Dominion in the known world! You are a monarch, like your parents before you, a ruler of a small pleasant kingdom of rivers and evergreens. Unlike your parents however, you have hopes and dreams! You want a bigger and better kingdom, with more rivers and trees. You want a Dominion! In all directions lie fiefs, freeholds, and feodums. All are small bits of land, controlled by petty lords and verging on anarchy. You will bring civilization to these people, uniting them under your banner. But several other monarchs have had the exact same idea. You must race to get as much of the unclaimed land as possible, fending your competition off along the way. In Dominion, each player starts with an identical, very small deck of cards representing the starting power of their nation. In the center of the table is a selection of other cards such as money, land, minions and buildings that you can buy. Through your selection of cards to buy, and how you play your hands as you draw them, you construct your deck on the fly, striving for the most efficient path to the land cards which contain the victory points needed to win the game. The gameplay in Dominion is pretty unique, yet is a surprisingly simple concept to learn. The core of the game is deck construction: building your deck of cards as you progress through the game, creating a fine-tuned engine that will help you accumulate the most victory points by the end. You start each round with a handful of cards from your customized and in-progress deck. In order for you to win the game, you have to make sure that the hands that you draw are efficient and effective. You do that by buying cards from the set of cards available on the table, each of which costs a certain amount of copper (ingame cash) to buy. As an example, it would not be wise to buy land cards (that give you victory points) early in the game, since they will just clog up your hand and prevent you from buying more cards or playing powerful actions. The available stacks of cards on the table usually contain a whole variety of card types. I say "usually" because 10 of those stacks are randomly selected from a much larger pool of cards, allowing for more replay value. You will have 3 types of land cards with different victory point amounts and 3 types of treasury cards that provide different amounts of cash. And the 10 random cards may include passive action cards, attack cards, reaction cards and cards that last for long durations. These cards will have a huge variety of effects that you can use to advance your strategy. You could buy cards that allow you to perform more actions, or cards that will let you draw more cards, or even cards that provides you with more cash in order to buy the very expensive cards. You could get attack cards that will interfere with your opponents' strategy. There's nothing wrong with stealing money from your opponents or forcing them to discard good cards. After all, all's fair in love and land-grabbing! In the end, the player who constructs and uses his deck most efficiently will be able to accumulate the most amount of land and win the game. As you can tell, there is a lot of randomness in Dominion, from the random cards that are used to set the table to the randomness of your hand draws. This is therefore not a game where you can plan the perfect opening move etc, and might not appeal to every player. It is however a game that can be learnt and mastered very quickly, and a great way of easing new players into the Eurogames which require more strategy and planning. Overall, Dominion introduces a great concept in constructing your own play deck. With a couple of expansions already in hand (and with more to come), a whole lot of interesting cards are added to the mix all the time. With so many available cards with interesting abilities, each combination of cards will create a whole new type of game with different strategies, keeping the game fresh and entertaining. In addition, new expansions such as Dominion: Alchemy are being introduced that change the gameplay and add more depth and strategy too.